Wagons… We’re constantly reminding readers about them here at CarAdvice. Don’t just sleepwalk into a dealer and buy an SUV like everyone else, when a wagon is more than likely the solution you need – it’s a message you’ll read and hear from us often. What about performance wagons then? What about affordable performance wagons? What about wagons with plenty of standard equipment? That’s where the Skoda Octavia and Subaru Levorg come in – especially in the guise as tested here. In the CarAdvice garage, we’ve got the 2018 Skoda Octavia RS245 and the 2018 Subaru Levorg STI Sport – both range toppers in their respective stables. While the advantages (luggage space, car not SUV-like driving dynamics, style and standard inclusions) are obvious, disadvantages are few. It’s an easy sell when you think about it: a sensible family car that also happens to have more than a little in the way of sporting pretensions, and you’ll get plenty of credibility too. Would you rather be driving one of these or a Skoda Yeti or Subaru Outback for example? Nothing wrong with either of these vehicles, but I know which I’d rather be behind the wheel of. Let’s get down to it then. For me, this is where this particular comparison is most interesting. You’d fully expect the Skoda – on paper at least – to be more expensive than the Subaru, and yet it isn’t in the real world once you run the numbers. In fact, the Skoda value equation, which can admittedly get a little boring (and we talk about it a lot in testing here at CarAdvice), is perhaps stronger than with any other model here with the performance-focused Octavia. 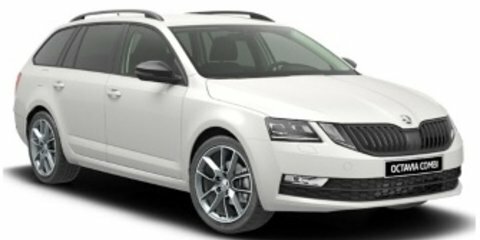 The Octavia RS245 (with automatic) starts from $47,390 in wagon form before on-road costs and as tested, ours has the optional Tech Pack ($2300), Luxury Pack ($1500) and automatic boot opening ($500). That brings the price to $51,690 before on-road costs. Standard equipment highlights (which differentiate the 245 from the RS169 TSI) include: 19-inch alloy wheels, black exhaust tips, and leather/Alcantara seat trim. Other standard equipment highlights include: 9.2-inch infotainment system with navigation, Apple CarPlay/Android Auto, adaptive LED headlights with LED DRLs, LED tail lights, red-painted brake calipers, front and rear parking sensors, selectable driving modes and a progressive steering weight system. The Tech Pack brings with it park assist, adaptive chassis control, advanced keyless entry with smart start, a 10-speaker Canton audio system and manoeuvre braking assist. The Luxury Pack adds leather/Alcantara trim, electrically adjustable front seats, heated front and rear seats, blind spot detection and lane assist. The Levorg STI Sport, on the other hand, starts from $51,990 before on-road costs, with standard equipment highlights being: exclusive maroon leather-trimmed seats, unique front bumper and grille, STI 18-inch alloy wheels, Sport # mode, a full suite (EyeSight) of electronic safety kit, 7.0-inch touchscreen, heated front seats, sports seats and a smart rear-view mirror. Under the bonnet performance ability is key to the sports-wagon DNA, and the Skoda – which shares an engine with the Golf GTI Performance Edition 1 – is no shrinking violet. The 2.0-litre turbocharged petrol engine hammers out 180kW and 370Nm. Drive is sent to the front wheels through a six-speed DSG, and there’s a mechanical LSD in the mix as well. The RS245 will scamper from 0–100km/h in 6.7 seconds in wagon form and up to a top speed of 250km/h. Its ADR fuel claim is a hard to believe 5.4L/100km on the combined cycle, and on test we used an indicated 10.9L/100km, with that figure nudging up into mid elevens the minute you get too excited with the right pedal. The Subaru likewise makes use of a 2.0-litre turbocharged petrol engine, but it trumps the Skoda in the power stakes with 197kW at 5600rpm. It can’t match the Skoda’s 370Nm, though, weighing in at 350Nm at 2400–5200rpm. The Levorg gets Subaru’s famed AWD platform under the skin, but somewhat jarringly, a fun-sapping CVT rather than conventional automatic. There’s no manual option available either. Subaru claims the Levorg STI Sport will scoot from 0–100km/h in 6.6 seconds. The ADR fuel claim is 8.7L/100km. On test we used an indicated 11.5L/100km, with the live figure running higher if you get too enthusiastic with the throttle pedal. Even at first glance, it’s hard to argue that the Skoda’s interior doesn’t feel more premium, more insulated and a step above the Levorg’s in terms of overall quality. The Skoda has simple steering wheel controls that are nicely laid out, gauges that have a touch of class to them, and a high-quality infotainment system. We found Apple CarPlay/Android Auto worked faultlessly, as did the old Bluetooth connection and audio streaming. The touchscreen itself is clear, sharp and responsive. The proprietary satellite navigation also worked beautifully over the course of our week behind the wheel. We love the lined door pockets, which stop most rattling noises that emanate from them once you’ve loaded them up with a bunch of junk you don’t really need, and they will hold decent-sized bottles too. Ahead of the shifter, there is a USB and auxiliary input along with a decent storage bin and shelf that will hold larger smartphones. The console bin in the centre is too small to really be useful for much and the centre cupholders are pretty small too. There’s an insert you get that will hold the key and smaller smartphones, and we love the little rubbish bin that clips into the door pocket and has a plastic bag attached to it. The Skoda has higher-quality seating and general comfort levels than the Levorg, with the contrasting leather/Alcantara trim looking as good as it is comfortable. There’s auto-down on all four windows, rear air vents, twin USB inputs in the second row, heated rear seats as well as heated fronts, and more than enough room for two adults in the second row regardless of how tall the front seat occupants are. The luggage cover in the back section is sturdy and keeps items away from prying eyes, bag hooks make transporting shopping safer and less hazardous, there’s a decent light back there, and seat releases that make folding the second row down as easy as possible. That space opens from 588 litres up to 1558 litres with the second-row seats down. We liked the rubber floor liner, which will be great for parents with kids that play muddy sports, and the 12V plug back there will come in handy for fridges and the like too. There’s an elastic cargo net and an electric tailgate. The Levorg gets Subaru’s excellent EyeSight system – across more affordable models too – but there are far too many buttons on the steering wheel. You’ll eventually work them all out, but it’s not easy the first time you set yourself up behind the wheel. The S# drive button, for example, isn’t easy to spot until you work out where it is. Put simply, it’s not immediately easy to work out which button does what. The infotainment system is best described as basic compared to the Skoda, with no Apple CarPlay/Android Auto, and the proprietary navigation is basic but accurate. On the other hand, the Bluetooth connection is one of the better ones we’ve tested recently, and it’s clear at all times with streaming that works well too. The top screen that is mounted up high on the dashboard is driver focused, with readings like a boost gauge and accelerator percentage. There’s a large bin ahead of the front shifter, with USB, auxiliary and 12V sockets, and it’s a good size for larger smartphones. The front seats are heated, but the backs aren’t like the Skoda. The Levorg has auto-down on all four windows, twin cupholders behind the shifter with a clever retractable cover, a small bin with twin USB inputs and a 12V socket at the elbow point, and small front door pockets that won’t hold a lot but are lined and will swallow a decent-sized bottle. The two-tone leather trim is decent but not as premium as the trim in the Skoda, and the seats themselves aren’t as comfortable either. That’s especially the case up front, where the side bolsters and squab aren’t broad enough for larger bodies, while we’d like the driver’s seat to sink lower into the cabin for taller drivers. Like the Skoda, the second row is genuinely comfortable for adults, but there are no air outlets strangely. There are, however, twin USB inputs and room only for small bottles in the second row. In the luggage space, there is a quality cover, electric seat releases, plastic bag hooks, a light, small mesh pockets at the side and space that expands from 489 litres to 1413 litres with the seats folded down. The numbers indicate that the Levorg can’t quite match the Octavia for useable luggage space. On paper, you’d expect the Levorg to keep churning up near redline, and the Skoda to pull hard off the mark thanks to the extra torque, and in the real world that’s pretty much how it pans out. The RS245 has more than enough meat on the bone to do what the intended buyer will require. It delivers enjoyment as expected, but a level of engagement and connection that took us a little by surprise. We expected it to feel ‘sporty’, but perhaps not as sporty as it was in reality. Its 19-inch rims shod with 225/35/19 rubber ensure the Octavia’s ride is firm rather than cosseting. Around town that’s no issue, but hit a few ruts mid corner and it can unsettle the RS245 whereas the Levorg remains nonplussed. The ride rarely ever erred on the side of harsh, but it was firm enough to skip about and crash through the nastier bumps. The engine and seven-speed gearbox combo is, as we’ve come to expect, excellent. There are a few very minor DSG gremlins, mainly during on/off throttle application at crawling speed, but once moving the shifts are crisp and precise. The engine’s healthy serve of torque means the Octavia will get off the mark rapidly, and will chirp the tyres if you try hard enough, but we loved the way the torque steer is mitigated by the LSD. The way the torque is delivered muscles up the mid-range too, such that the RS245 keeps piling on speed nicely when you want it to. Switch into ‘RS’ mode and everything sharpens up a bit including the exhaust note, and the Octavia feels as close to a hot-hatch driving experience as it’s ever going to get. Where the Octavia does deviate from the best its stable mates can deliver is steering and front end balance. As soon as we wound up the wick into the twistier sections, the Octavia felt heavier than the Levorg, not as nimble, not as sharp, and not as keen to change direction. It wasn’t cantankerous by any means, but it couldn’t match the Levorg for corner entry, balance and precision at the exit. Plus, it feels like a heavier beast at this end of the driving spectrum too. With the family performance wagon brief eight parts day-to-day banality and two parts weekend fun machine, though, it’s hard to argue with the RS245’s modus operandi. The 19-inch rubber was quite noisy at speed and across coarse chip, and there was the feeling of understeer creeping in at speed as well – the Octavia gets larger rims but the same cross-section in real terms. Drive the RS245 up to legal speeds, though, and it gets the job done without any hair-raising moments. Deal breaker? No, not really. Especially given how all-round capable the Levorg is. With the power advantage it has over the Skoda, the engine sings to redline and loves the workout too. In S# mode, the CVT does an admirable job of delivering the sensation of eight ‘regular’ gearshifts and the throttle feel is sharp too. Where the CVT does let things down a bit is when you want to roll on with some sense of urgency. There’s a hesitation, nothing much happens for a second, and it thus feels slow picking up out of corners. We found if you started to use the pedal earlier than your brain wanted you to, you could drive around it, but it’s not really an ideal situation. The Levorg gets 225/45/18 rubber, which in part assists in delivering a better ride, but the springs and dampers deserve mention here too. They combine to ensure the Levorg can soak up the worst you can point it toward without ever feeling unsettled or skittish. We didn’t expect it to soak up nasty roads better than the Skoda, but the fact is, it did. The ride around town is also well above average, but the throttle calibration, or perhaps the sharp way in which power comes in, makes smooth driving difficult. You’ll get more used to it over time, but it’s not a vehicle you can sit in and immediately drive smoothly like you can the Octavia. The front suspension can crash over sharp speed humps, but the jarring sound doesn’t translate to the need for a kidney belt inside the cabin. At speed, the steering, front-end feedback and grip all feel more accomplished than the Skoda, and there’s no doubt that gearbox aside, the Levorg is the more engaging, enjoyable and reassuring vehicle to punt hard. It is also fair to say, though, that the Levorg doesn’t feel quite as sharp or rapid as something wearing ‘STI’ badging really should. The tyres will reach the end of their tether if you get too excited with the throttle in the twisties, and they are also noisy on coarse chip or at freeway speeds. The Skoda is covered by a five-year/unlimited-kilometre warranty with servicing required every 12 months or 15,000km. Over the first three years, services will cost: $322, $398 and $598 respectively – a total of $1318. The Subaru Levorg is covered by a three-year/unlimited-kilometre warranty with servicing required every six months or 12,500km. 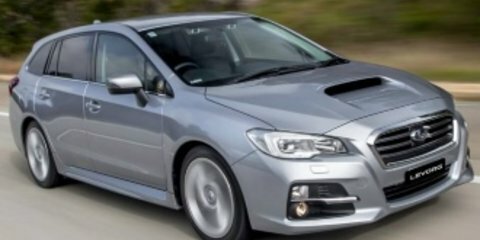 Over three years, six services within the Subaru capped-price regime average out to approximately $375 per visit for a total of $2250. This is one of the tougher head-to-heads we’ve had to work on recently at CarAdvice. It’s really that close. The pricing is close. The amount of kit for the final price is close. The adherence to the ‘warm’ sports-wagon brief is also close. In some ways, the Levorg is the better car here. Its ride is generally better (both around town and on B roads) and it feels less weighty and cumbersome when you find a twisty road and really want to hook in. Let’s face it too, that’s why you’d be buying these performance wagons. You’re not going to buy one to trundle around town in traffic every day without a weekend pay-off – if that’s the case, you’d buy a less potent variant and save some coin along the way. Yet, while the Levorg is better – perhaps more accomplished is a neater way of saying it – in those instances, the Octavia has a premium sense of execution that the Levorg can’t quite match and the value for money proposition – always a Skoda strong point – is hard to argue. That execution is most visible in the cabin. With that in mind, it’s the RS245 that comes out on top here – just. That’s in an overall sense, mind you. If I had to pick the more engaging driver’s car, it’s the Levorg – which has long been a Subaru strong point. Without wanting to get the proverbial splinters by sitting on the fence, you really won’t go wrong with either of these cars, they are both excellent. Just do yourself a favour – test-drive one of them after you’ve done the sheep thing and driven an SUV. Chances are you’ll actually prefer driving a wagon.